An NHS nurse said it was as though staff were paying "a fee to get a job". 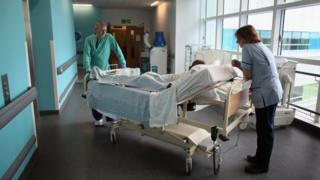 NHS Employers said passing on costs was down to "local discretion". Data from the NHS jobs website showed more than 2,900 adverts stating the cost of a Disclosure and Barring Service (DBS) check would be deducted from the worker's salary - about one in 10 of the adverts listed since January. "I thought if the company wasn't willing to invest that for me, then I could come up against barriers for future training needs," said Ms Watt, from the New Forest. The hotel, in the East Midlands, did not explain why it was necessary, just telling 34-year-old Ms Watt "everyone has to do it". "They expected me to fully fund a DBS and do it myself. They just wanted the certificate once I had gone through the process. The job was a marketing manager in a hotel, so in my opinion did not warrant such high security check levels." A community psychiatric nurse from Yorkshire, who asked not to be named and for the trust he worked for to not be identified, said: "This is a hidden cost just for going to work. "It's their [the trust's] responsibility to check staff, not the staff's responsibility to pay for their bureaucracy. "Mine is an enhanced check so I have to pay £44 every year. It's unacceptable." "My trust in Yorkshire makes us pay, but other trusts in other parts of the country pay for new joiners," the nurse added. "It's a fee for getting a job." Karolina Gerlich, chief executive of the National Association of Care and Support Workers (Nacas), said: "People are worried about the cost involved. It is a lot of money to be asked to pay straight after getting a job. "There is a service people can enrol in to keep their DBS up to date, which costs £13 a year, but it's not advertised enough. "The initial cost is a lot for low-paid care workers and many do not have the funds available. "Some companies will charge different rates. Some will eventually give the money back and some will not." The BBC found 25 NHS employers where every advert mentioning a DBS check explained the cost would be deducted from the worker's pay. However, more than 500 other employers did not deduct the fee. A spokeswoman said: "The hidden costs of working for the NHS are just another financial challenge that our members are having to deal with." A spokesman for Manchester University NHS Foundation Trust, which had the largest number of jobs advertised with deductions, said: "It is common practice amongst NHS Trusts across the country to recharge candidates for the cost of the DBS. This has been in place for a number of years. "Once acquired, the DBS certificate is owned and retained by the candidate rather than the organisation. Candidates also have the option to join the DBS Update Service, which enables them to use their disclosure certificate when applying for other positions, or if they wish to take up a volunteering activity." A spokeswoman for York Teaching Hospital NHS Foundation Trust said: "Back in 2015-16 the trust spent nearly £70,000 on DBS checks, which was clearly a significant cost to the organisation. As such, from April 2017 the trust introduced a process to reclaim the costs of the checks from the appointed candidate. "As all of our neighbouring NHS trusts were already charging for DBS this brought us in line with other employers." A spokesman for North Cumbria University Hospitals NHS Trust, which had 154 adverts mentioning DBS checks, said: "We give all new employees the option to spread the cost over three or four months." He said the trust had "not seen any negative impact on the ability to recruit to posts however we will continue to monitor this". Jagriti Patwari, director of Eurocom CI, a company that carries out background checks, said: "It is common for candidates to be asked to cover their own cost of their DBS check where it is high turnover jobs because candidates normally don't stay in the job long, such as bank staff of nurses and care homes." An NHS Employers spokeswoman said: "Charging potential employees for DBS checks is down to local discretion. "There are similar requirements on a number of colleagues to maintain professional memberships and registrations, which are also borne by the employee."